Let's Talk About Your Bum, Really? You may be aware that Cottonelle is now marketing baby wipes for adults. 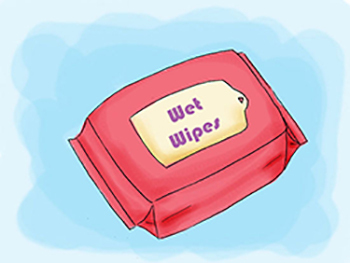 This has become quite controversial in the media and for environmentalist and mostly because Cities are saying wet wipes are clogging the sewer systems and costing them lots of your tax paying dollars. Here is a link to three articles about this issue for you to read ABCnews, News8000 and Seattletimes. So what do you think about this, I would really like to hear your comments about this issue. Do you agree with the Cities and the problems they are having? Do they have a big impact on the environment? Is a bidet a better solution? I obviously think that having a Bidet Toilet Seat is not only a more environmentally green solution, but way better at getting you cleaner and healthier without clogging the sewer systems. For people with septic tanks, I think a bidet seat will be a huge money saver when it comes to maintenance on your select tanks. Before I started using a Bidet, I used to use baby wipes, because I just did not feel that I was getting myself clean with toilet paper. It was somewhat of an improvement over using toilet paper as far as getting you cleaner, but I just did not like the idea that stuff was soaking through the wipes and getting on my fingers, yuck. It also never did help my hemorrhoids ether and sometimes made them worse. It wasn’t until I started using a bidet that my hemorrhoids cleared up right a way and have not bothered me since (over 7 years now). So lets talk about your Bum! If you really want a clean Bum and I mean really clean, you should install a Bidet Seat, and then and only then will you have a really clean Bum. So stop bumming around and take some action and order a bidet from my site right now, the Bidet Toilet Seat Store.